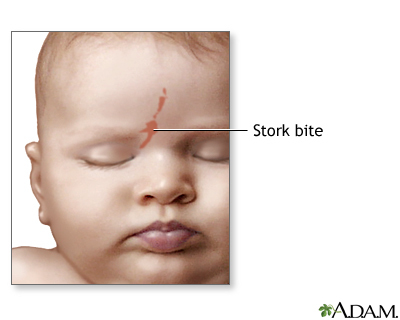 A stork bite is a common type of birthmark seen in a newborn. It is most often temporary. The medical term for a stork bite is nevus simplex. A stork bite is also called a salmon patch. Stork bites occur in about one third of all newborns. A stork bite is due to a stretching (dilation) of certain blood vessels. It may become darker when the child cries or the temperature changes. It may fade when pressure is put on it. A stork bite usually looks pink and flat. A baby may be born with a stork bite. It may also appear in the first months of life. Stork bites may be found on the forehead, eyelids, nose, upper lip, or back of the neck. A health care provider can diagnose a stork bite simply by looking at it. No tests are needed. No treatment is needed. If a stork bite lasts longer than 3 years, it may be removed with a laser to improve the person's appearance. Most stork bites on the face go away completely in about 18 months. Stork bites on the back of the neck usually do not go away. The health care provider should look at all birthmarks during a routine well-baby exam. Habif TP. Vascular tumors and malformations. In: Habif TP, ed. Clinical Dermatology. 6th ed. St. Louis, MO: Elsevier; 2016:chap 23. Martin KL. Diseases of the neonate. In: Kliegman RM, Stanton BF, St. Geme JW, Schor MF, eds. Nelson Textbook of Pediatrics. 20th ed. Philadelphia, PA: Elsevier;2016:chap 647.